Get Your Free Spins For The Hot Hot Volcano Slot Game! 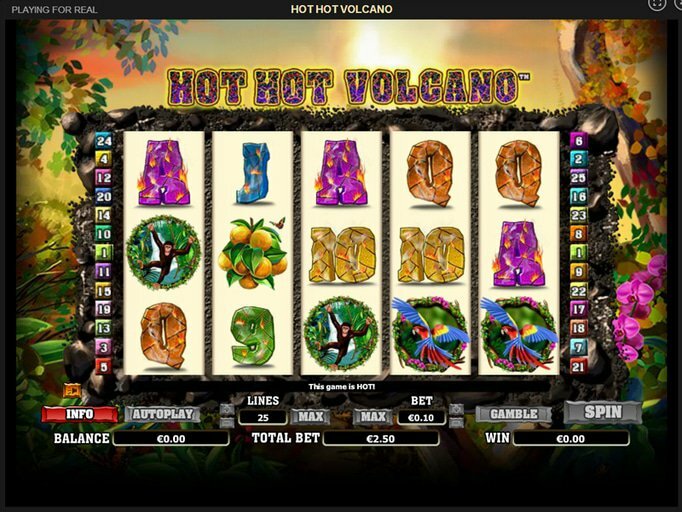 People who prefer lots of prizes with moderate values over huge jackpots will certainly like the Hot Hot Volcano slot game from NYX Interactive. The bubbling, gurgling volcano takes the center stage behind the five reels containing 25 possible paylines which are encased in typical jungle fare. Some of the symbols that can help you earn a payout include monkeys, parrots, lizards and more. The top jackpot here is only $1000 with wagers starting at a penny and climbing to $50, but you'll notice that moderate prizes are quite frequent. When you get started, the first thing you'll likely notice is the optional Gamble feature which is triggered after any line win. You'll be able to guess the color of a card to double your prize or even its suit to quadruple it, but you'll need to be selective about this since an incorrect guess could cost you your entire stake. Again, this is optional, so you aren't required to participate. Just click 'No' when asked if you'd like to gamble. The second noteworthy feature is the Volcano since this icon can substitute for any regular symbol on your screen to help you win more often. They are only wild on the middle three reels and they will erupt when they appear, spewing lava onto the entire reel and triggering five free spins. As this feature progresses, the wilds will stay in place and maximize your chances of winning big! Though the scatter and wild are one in the same with this title and the jackpot is small when compared to other offerings from this provider, you'll still have a great time playing it. To get started for fun, you can visit Tropezia Palace Casino where you'll find the Hot Hot Volcano free spins just to try it out. If you like it, or even if you're interested in trying out something else offered at this site, you can get a 200% match of your first deposit that is worth up to $200 as well as 20 free spins for their notorious Aliens slot game!